I've been thinking about ombre nails for a while but have yet to try until I saw Lauren Conrad rocking them from a red to pink gradation of color. I thought her manicure looked so cute, especially paired with her floral frock, so I attempted to try out this new nail trend myself! I decided to go with a purple to lilac gradation of color since I already had a few colors stashed in my nail polish collection that I had yet to try. Here are the colors I chose (from left to right: 2 Ulta3 Colors; OPI "Do You Lilac Me"; Essie "Lilacism"; and Essie "Main Squeeze"). And this is the result I achieved. The hardest part is finding the best colors that will give a soft gradation on the color wheel rather than one that is harsh or jumpy. Nail polishes also have a tendency to look different in the bottle than they do on your nails, so you may want to test them before buying/painting. Bottom line, ombre nails are a fun trend to try, and look especially cute when paired with a a coordinating outfit, such as Lauren Conrad did. What are your thoughts on the ombre nail trend? Is this something you would want to try? I hadn't even seen this trend until now! I love it... that is so cute. I think a lot of nail things end up looking tacky, but this just looks fun and cute! That is so cute! Love, love, love. I'm going to have to try this. I haven't seen it until now! I think it's really cute! I've also seen color blocked nails, with one hand different from the other. It looked fun. Good idea! I just saw a picture of Ombre Nails yesterday for the first time and was thinking of trying it! Really Cute! My first thought is: junior high. But this could be one of those trends that grows on me. Unfortunately I probably couldn’t pull it off in my conservative work environment. I must be living under a rock because I had not seen this trend yet! As obsessed as I am with nail polishes, I'm surprised I haven't done this yet! It looks super cute on LC & on YOU, too! I love the colors that you picked! LOVE IT. I'm going to try this with for my college senior formal on saturday! so pretty! definitely doing this for my graduation nails. i'm excited. and pink will go perfectly with my red dress! ahhh this is so cute what an awesome idea! Love it! I think it looks good...I love purple nails! I have definitely thought about trying it, I have about 5 different pictures of it on one of my pinterest boards haha. I'll probably try pink since I have so many of them! Yours look great! Love it! Esp bc it's purple! I just recently heard of this trend, and I'm loving it! I just need to get myself some nail polish! 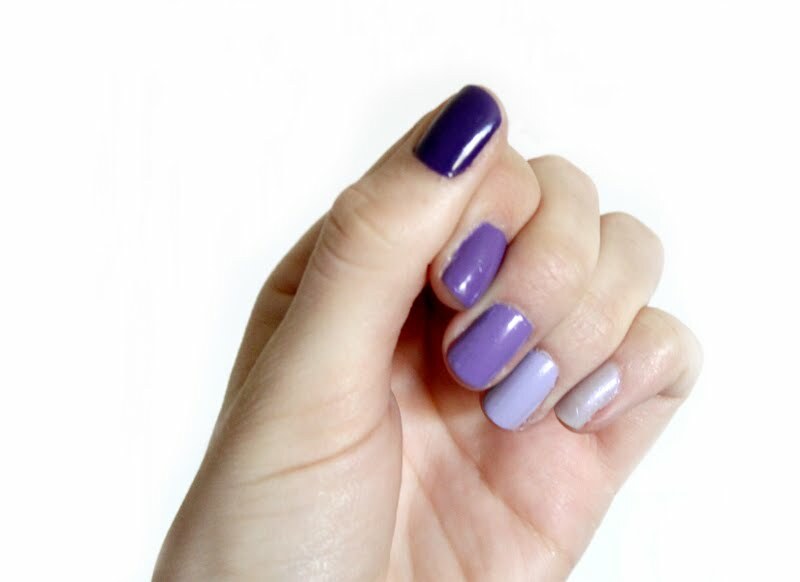 I love the ombre look on nails, it is so fun for spring! Can't wait to try it, your purple looks great! Haven't heard of this trend! but its a super cute idea!! I think i might try it this weekend for date night! I have just started seeing this all over the blogosphere and I definitely want to try it! I especially like the idea of tailoring it to a specific outfit, like LC did with florals. Absolutely!! I'm loving it!! The purple hues are fabulous!!! I think a kelly green to a mint would be pretty awesome too! I think that'll be my first try at it! Love the idea... but I think I would get bored quickly! Haha! Definitely something I have to try... who knows? I could love it more than I realize! i love it!! !will try it! YES!! I will for sure be trying this, and I love the purple its so chic!! Wow! I haven't heard about that trend yet! Such an interesting decision! oh.me.gee. gotta try this one! i'm so bored with matched nails, that lately i've painted a thumb or a pinky with a contrasted color. so i'm loving this one!!! 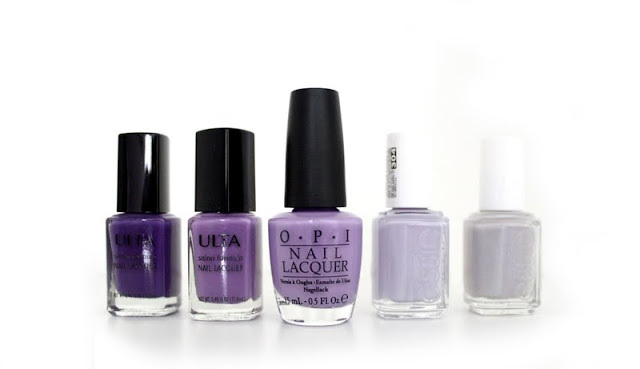 I'm a nail polish addict, and I love this idea! What a great idea! I'm definitely going to have to try this! I do my own nails (and nailart) all the time and have never thought to do this!! I'll definitely be giving it a try. Thanks for sharing hun! Ohhhh! Im deff giving this a try! I love the sound of this idea! I'll definitely have to try it! OBSESSED!!! The Lilacs are SO PRETTY!! i don't think this is something i could pull off, but it looks cute! This is so creative! I love this idea- now I just need a colorful outfit for my nails to go with. Your blog is adorable...just came across it and can't wait to read more! I love this! I would never have even thought of this. ooooh VERY cool. I am definitely going to try this soon. I just painted my nails today--- but when they start to chip I'm trying ombre nails... woohoo! Thanks for sharing! I saw that picture of lauren the other day too! totally cute!